Recognized by many Nashville music industry officials as America's No. 1 Christian Country/Comedy group, The Fox Brothers, are becoming a household name among fair and festival-goers throughout the United States and Canada, making them a brightly shining, rising star on the horizon of Christian music. That rising star catapulted in 1999 and 2000 when the group won three major awards from the Christian Country music industry. In November, 1999, the group was presented the "Entertainers Of The Year" award by the Nashville-based Christian Country Music Association. In November 2000 and 2001, The Fox Brothers repeated as the CCMA's Entertainers Of The Year and were also presented the organization's Vocal Group Of The Year. In 2002, the brothers were once again awarded the Group Of The Year trophy. But, winning awards is only a small piece in their stardom puzzle. Throughout their distinguished careers, The Fox Brothers have performed extensively at fairs and festivals throughout the United States and Canada. "We love to perform for the people wherever we are able to go," said Lynn Fox, the group's baritone/keyboard player/emcee. "They are always real friendly, and they seem to enjoy coming to see us." Another factor that has added to their growing fame is their recent leap into the computer age with their own web page which can be found at www.foxbrothers.com. "We have enjoyed communicating with our fans through the Internet," said Lynn. "We have a form on our web page where people can join our fan club for free." The group's appearances on the world-famous Grand Ole Opry have given them an instant fame and credibility among country music fans worldwide. "We are blessed every time we get to perform on the Opry," said lead singer/bass player Randy Fox. "Every time we get to perform on that stage, my brothers and I are fulfilling our childhood dreams." In addition to the three blood brothers, the group also consists of bass singer/lead guitarist, John Abernathy; drummer, Todd Mortl; Brent Fox, sound engineer/trumpet player. Although the blood brothers have been singing together since their pre-teen days, during the last five years, The Fox Brothers have been busy touring, gaining numerous awards and a solid reputation for excellence among fans and music critics alike. Since 1995, the group has had numerous No. 1 Christian Country radio singles - "Turn My Life Around" in 1996; "Red Top Mountain" in 1997; "Cradle Of Love" and "Say It Now" in 1998, "He Broke The Law" and "Backslider's Prayer" in 2000, "Your's" in 2001, "Red, White and Blue" and "In This House" in 2002. "We are proud of our association with the folks at GCN Records and the blessings we have received by being a part of the label's roster," Lynn said. "Because GCN has distribution through Wal-Marts, our music has been selling real well." In addition to their televised Grand Ole Opry performances, The Fox Brothers have performed on numerous popular television shows, including "Nashville Now;" "Crook & Chase;" and other programs on The Nashville Network. In 1995, The Fox Brothers were named the "Country Gospel Group Of The Year" by the International Country Gospel Music Association. In 1996, they were awarded "The Vocal Group Of The Year" by the Christian Country Music Association. In 1998, they received the award as the "Family Group Of The Year" by the Country Gospel Music Guild. In 2000, the Guild presented the group with the "Album Of The Year" award and in 2002, they were named "Band Of The Year by that organization. The Fox Brothers are currently touring the United States and Canada. Their tours are coordinated by Century II Promotions in Nashville. "We love to travel around the United States and in Canada," Roy said. "We get to meet a lot of great people who love music and life. When we get to entertain them, that's when we are at our happiest." As a country and gospel music DJ, I have played every release from this project. Like Ol' Hank, If that Ain't Love, Tending To Todd, and the current single Long As I Got You have all made heavy rotation at our station. These guys continue to get a lot of requests from our listeners. They continue to get airplay, month after month and year after year. I had a chance to meet the Fox Brothers and see them perform live at the ICM Convention in Nashville last year. They are awsome entertainers, plus they're really nice guys, too. Take it from someone who plays a lot of music every day. 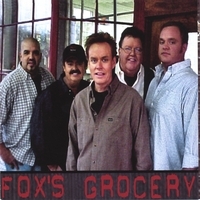 If you like great country and Christian music, you need to add Fox's Grocery by the Fox Brothers to your collection. I did! I have this CD and it stays in my CD player in the car. It has some really good upbeat songs that I personally like plus some heart wrenching songs that contain a wonderful Christian message that I feel that folks like me and my family can relate to. My favorite songs are TENDING TO TODD, IF THAT AIN'T LOVE, SQUARES, and LIFETIME TOO SOON. Our family has seen this group live and we absolutely love their show. I would definitely recommend going to see them live. I also highly recommend this CD. totally impressed by the timely delivery and condition of the cd. i am very impressed with all of the songs on the prodject. the song that really touched me and my wife is tending to todd.we just found out my mother has the onset of alzheimer's disease.tending to todd just seems to tell the story.we heard the song on kjic-fm 90.5, in santa fe, tx. god had us turn on radio at just the right time to hear it. thanks, from me and my family. These guys are awesome!! Your missing out if you have never listen to their music. I know the Fox Brother's and their Father (GIlbert), and their Aunt Geraldine and Uncle Mutt. (Owners of Fox Grocery) and some other family members. They are all wonderful, caring, Christian people. I give this album 5 stars, not because of knowing them but because the album is great... Best wishes to them and keep singing the beautiful songs!